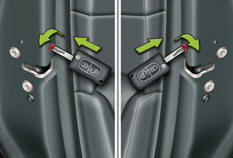 Mechanical system to prevent opening of the rear door using its interior control. The control is located on the edge of each rear door. - to the right on the right-hand rear door. - to the left on the right-hand rear door.